One of the biggest problems that a community faces is members who do not make their payments. Nobody wants to live in a neighborhood that is not properly maintained or has to raise dues simply because some of the members are not doing their part. HMS has partnered with Sperlonga Data & Analytics to offer an OPTIONAL credit reporting service for Associations. With credit reporting, your Association's dues will be viewed with the same importance as credit card payments, mortgages, and car payments. Lowering the delinquency rates does more for the Association than just increasing the money available to spend on landscaping and pressure washing. Members that voluntarily pay their dues so that they avoid a credit score penalty are also preventing the Association from having to pursue expensive collection options. Credit reporting can be a very cost-effective alternative for getting accounts up to date. "Reporting Assessment Payments to Credit Bureaus Is Good for Homeowners and HOAs"
A great article from HOA‑USA about the benefits of reporting assessment dues. 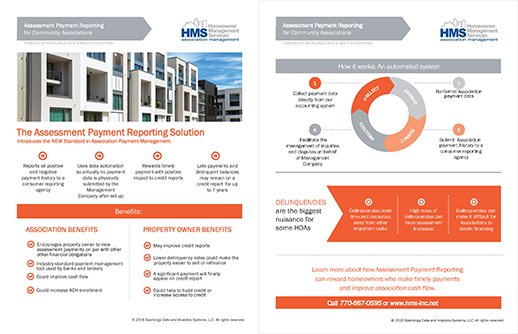 Contact HMS today to learn how your Association can use HMS' credit reporting program to increase the beauty of your community, and help your keep your dues where you want them: low!